While we have been fans of the direction Wired chose with their interactive magazine, there has been a lot of comments about the lack of a discounted yearly paid subscription model. With the latest Wired app version, that isn’t an issue anymore. After installing the update, we were greeted with a new screen on launch of the app. One offering for us to log-in with our print subscription ID or to buy a yearly subscription at a much discounted rate, like you get when you buy a year’s worth of the print version! The Zinio version of buying iPad magazines have been offered in the single issue or the discounted yearly model for a long time. Wired, with their more multimedia robust publication was not previously offering a purchase method other than a single copy at full price. 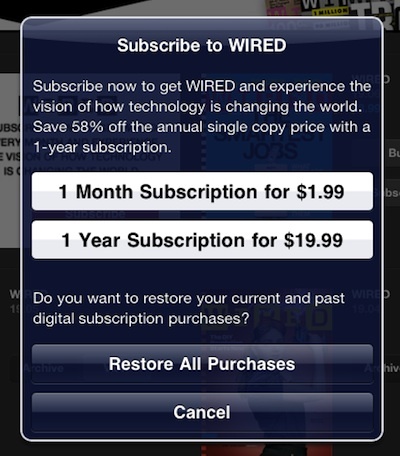 Choosing the Wired Subscribe button gives you the two purchase options. 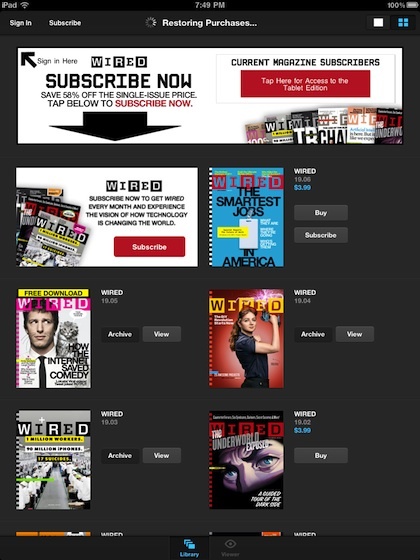 Notice that even the single issue of the iPad version of Wired is much discounted from the previous price. 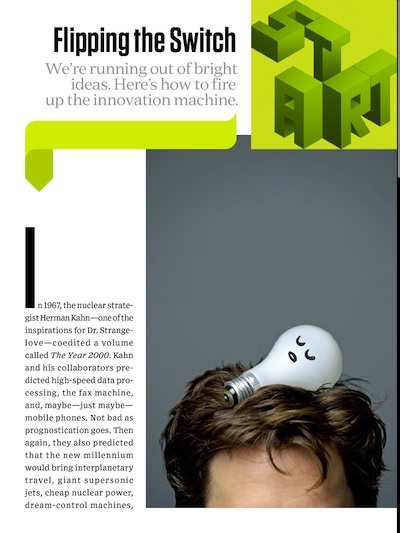 We have covered the many features in Wired’s iPad version that makes it a ‘robust’ magazine. We prefer the actual layout as well, with the top level of content being presented side by side, then the articles being scrollable ‘tall’. This layout means less time searching for how an article continues after the first page. Some multimedia is cute graphics that auto launch when you visit the page. Unlike actual content additions like different map views or multi-images for a deeper view, these are little graphics like the below light bulb going to sleep. These launch automatically when the page is shown on your iPad. Sadly, this cute feature is causing issues with the latest Wired app version. If you (6 people in the office reported the same issue) go to a page with one of these auto start graphics and your iPad does not have Internet access, the whole app quits. Surely a simple fix but you can’t launch the app to read that magazine till you get online.